Made You Look! offer a variety of packages to Retailers to help with their Visual Merchandising. What is the most popular course and how does it benefit Retailers? Visual Merchandising covers a wide spectrum of skills, and our specialism is visual display and display styling. There is a science behind grouping and merchandise handling which is crucial in creating impact and silent sales. We’ve broken the fundamentals into simple steps which is the basis for most displays. Our illustrated Talks emphasise the reasons why good shop window displays are crucial for attracting customers, whereas our Presentations are a little longer and teach the basic rules and guidelines of display too. With a simple demonstration following our talk it brings it all to life. We also offer One-to-One sessions with businesses at their own level and in their own premises or suitable venue, but the most popular course is our Taster Day. This gives delegates the opportunity to learn the theory first and then practice with some simple products so it all makes sense and becomes a reality. And as most retailers are time-poor, we have Mini-Taster sessions lasting just half a day which are a real hit with everyone and means we can offer twilight sessions for convenience too. With our ‘simple-steps’ guideline delegates understand the basic building blocks of display and how to create a display, then leave full of exciting ideas to take back to their workplace. We have worked with a few retailers who have had no idea what to do with their shop window yet we have given them the confidence and enthusiasm to try out new skills and create great displays. Why do you think Visual Merchandising is so important? It’s silent advertising. Subliminal messaging enticing the customer in and around the shop; telling them what they need to buy before they realise they need it themselves and ultimately creating sales. It’s not ‘just dressing dummies’! First impressions count and the same applies to shop fronts and interiors which have a positive or negative effect on neighbouring businesses, the street and even the area, and ultimately whether people will stop and explore, stay and return. It has a huge part to play in attracting tourism too. However I have only tickled the surface of VM and window displays. It really does work, which is why the big London stores spend so much money on VM – they wouldn’t do this if they didn’t receive a return on investment. 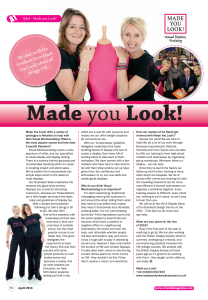 How can readers of A1 Retail get involved with Made You Look!? Spread the word! We are here to help! We do a lot of our work through Business Improvement Districts, Councils and Town Teams who are able to offer our training to their high street retailers and businesses by organising group workshops. Wherever there’s a display – we can help. Once they’ve learnt the basics we follow-up with further training or shop visits which are bespoke. We do of course offer one-to-one training but with the travelling involved it can be more cost-effective if several businesses can organise a workshop together. Every training session is different, every client too – nothing is set in stone so we’d love to hear from you. We will be at the VM & Display Show at the Business Design Centre on the 20th – 21st April so do come and say hello. Busy if the first part of the year is anything to go by! We are also working with the British Display Society which is currently undergoing a rebrand, and re-introducing practical modules into VM college courses. We studied with the British Display Society all those years ago so it’s great to be working with them – they taught us the skills we use today.